Ughh I am late to the Currently party again, but better late than never I hope! 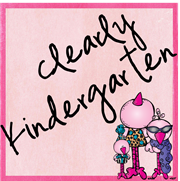 If you haven't already head on over to Farley's blog and link up, it is a fun one! My goal for next month is to make it on time! Listening - my own kiddo are watch some of Despicable Me before bed (I love that movie), so that is playing in the background. OK so now that I am actually finishing this the kiddos are long in bed and I am listening to The Bible series on History...but I am too lazy to go back and change it. Loving - I am getting ready for conferences next week so I have been redoing some running records on my lowest readers....and I am sooooo happy with how well they are doing! Some of them still have some work to do on comprehension but we will get there! 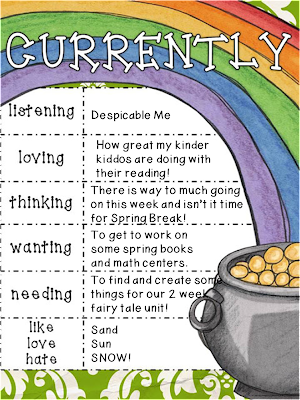 Wanting - I really want to get to work on some ideas I have for spring for my classroom and TpT I just can't seem to squeeze it in right now! Needing - I am in charge of my teams 2 week fairy tale unit that we are doing right after spring break....so I need to get my backside in gear and find and make some good stuff for us. If you know of anything good I would love to hear about it! Like - I like the sand and can't wait for our trip to Florida at the end of the month! Love - The sun...it was actually out today and even though it wasn't that warm it still felt like a taste of spring. Hate - The snow...I am really tired of the snow and cold and driving in it. I really hope it doesn't snow this week like they say it is going to! Hope everyone has a great week! I am hoping to have time to post some pics of our Dr. You Know Who stuff this week. I am also starting to get excited about getting to 100 followers...so I am starting to think about organizing a giveaway. Stay tuned for details!! Julie Lee over at mrsleeskinderkids.blogspot.com has a Fairy Tale activity unit! She makes great stuff. I can relate to the busy schedule! Seems like everything always piles up at once! Good luck! Thanks for the suggestion I will check it out! I'm so with you on HATING snow! I'm so ready for spring! I also watched the Bible premiere! It was really cool- i'm looking forward to the rest of the series! Yep I am so not a snow person! Will do I am on the hunt! Hope you had fun! Just saw that you're linked up to Wisconsin! I'm planning a blogger meet up this summer and will add you to my list. We're neighbors! Yay!! I was thinking of planning one as well! Can't wait! I am right there with you on your like, love, hate! Except I'm not going to Florida anytime soon! I'm so done with winter and cold and so ready for sunshine and warmth! I know I don't want to see one more snowflake! I love your blog - I'm following! Glad I stopped by, I love teaching Fairy Tales! Have you selected any to focus on? My team incorporates fables/tales throughout units (Food/Thanksgiving, we taught Stone Soup), but 3 Bears is fun. So is Gingerbread if you didn't do that in Dec. - there are so many variations of those. Cinderella is a good one too, lots of books for Korean/Japanese/African/French/Native American versions. The Talking Eggs is a good fairytale to read with a Cinderella study too. Lon Po Po & LRRH are fun to do. Jack & the Beanstalk can incorporate some science (plant growth) & measuring for math. The topics are endless, I guess it depends on what tales you want to target! I hope I gave you some ideas & didn't overwhelm you!! Happy planning :0)!